Every month the Energy Information Administration, a unit of the Energy Department, updates its Total Energy report, one of the most useful compendiums of data describing the interest and capacity of the American energy sector. The latest edition, published last month, illustrates a national oil and gas sector on a roll. Among the rich field of data charts contained in Total Energy, two are arguably the most revealing. Table 5.1 (page 77) reports that the number of oil and gas drilling rigs in operation across the U.S. last year reached an 11-month average of 1,865. That is the highest rig count since the mid-1980s, according to the EIA. Table 5.2 (page 78) reports on the number of wells drilled each year. 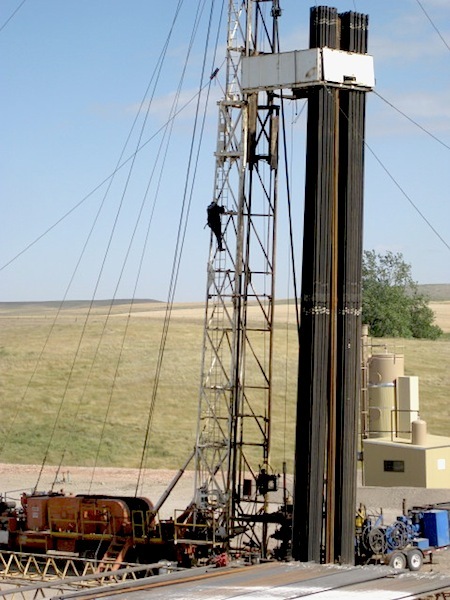 It shows that the surge in oil and gas production began around 2003, when just under 33,000 wells were drilled in the U.S. Last year about 45,000 wells (including one in North Dakota pictured above) were drilled. 1. More than 20,000 oil wells were drilled in the U.S. in 2011, higher than any year since 1985. 2. Of the more than 40,000 oil and gas wells drilled in 2011, just over 10 percent were dry. Said another way, 90 percent of the wells sunk into America’s shale oil and shale gas fields are producing commercial quantitites of fuel. In contrast, in 1985 drillers sunk almost 71,000 new wells. Over 21,000, or 30 percent, came up dry. As I’ve noted on ModeShift since returning from a reporting trip to North Dakota last month, a national oil and gas drilling boom is engulfing eight Great Plains states, four others in the mid-Atlantic and South, plus California. A convergence of new exploration and drilling techniques, rising global demand and prices, and suspect governing oversight is producing what looks to be the most powerful surge in fossil fuel production in U.S. history. From every vantage – economic, environmental, cultural, and security — the consequences are momentous. Last week Bloomberg reported that “China Petrochemical Corp., the second-largest Chinese oil company, agreed to buy a one-third stake in five Devon Energy Corp. exploratory oil projects in the U.S. for $900 million to expand holdings of reserves trapped in shale. The company, known as Sinopec Group, will pay $900 million in cash and as much as $1.6 billion in Devon’s future drilling costs, funding 125 wells in the coming year.” Devon is a major player in the Eagle Ford shale development in Texas. Another example is Total SA, France’s largest oil company, which announced just after the start of the year that it paid $2.32 billion to Chesapeake Energy Corp. and EnerVest for 619,000 acres of mineral rights in Ohio’s Utica shale region. There’s more to come in 2012. In central Louisiana, Devon Energy is developing new wells in the Tuscaloosa Marine Shale that researchers said may contain as much as 7 billion barrels of oil.